Moab is a city on the southern edge of Grand County in southeastern Utah in the western United States. The population was 5,046 at the 2010 census, and in 2017 the population was estimated to be 5,253. It is the county seat and largest city in Grand County. Moab attracts a large number of tourists every year, mostly visitors to the nearby Arches and Canyonlands national parks. The town is a popular base for mountain bikers who ride the extensive network of trails including the Slickrock Trail, and for off-roaders who come for the annual Moab Jeep Safari. The Biblical name Moab refers to an area of land located on the eastern side of the Jordan River. Some historians believe the city in Utah came to use this name because of William Andrew Peirce, the first postmaster, believing that the biblical Moab and this part of Utah were both "the far country". :16 However, others believe the name has Paiute origins, referring to the word moapa, meaning "mosquito". Some of the area's early residents attempted to change the city's name, because in the Christian Bible, Moabites are demeaned as incestuous and idolatrous. One petition in 1890 had 59 signatures and requested a name change to "Vina". :50 Another effort attempted to change the name to "Uvadalia". Both attempts failed. During the period between 1829 and the early 1850s, the area around what is now Moab served as the Colorado River crossing along the Old Spanish Trail. Latter-day Saint settlers attempted to establish a trading fort at the river crossing called the Elk Mountain Mission in April 1855 to trade with travellers attempting to cross the river. Forty men were called on this mission. There were repeated Indian attacks, including one on September 23, 1855, in which James Hunt, companion to Peter Stubbs, was shot and killed by a Native American. After this last attack, the fort was abandoned. A new round of settlers from Rich County, led by Randolph Hockaday Stewart, established a permanent settlement in 1878 under the direction of Brigham Young. Moab was incorporated as a town on December 20, 1902. In 1883 the Denver and Rio Grande Western Railroad main line was constructed across eastern Utah. The rail line did not pass through Moab, instead passing through the towns of Thompson Springs and Cisco, 40 miles (64 km) to the north. Later, other places to cross the Colorado were constructed, such as Lee's Ferry, Navajo Bridge and Boulder Dam. These changes shifted the trade routes away from Moab. Moab farmers and merchants had to adapt from trading with passing travelers to shipping their goods to distant markets. Soon Moab's origins as one of the few natural crossings of the Colorado River were forgotten. Nevertheless, the U.S. military deemed the bridge over the Colorado River at Moab important enough to place it under guard as late as World War II. In 1943, a former Civilian Conservation Corps camp outside Moab was used to confine Japanese American internees labeled "troublemakers" by authorities in the War Relocation Authority, the government body responsible for overseeing the wartime incarceration program. The Moab Isolation Center for "noncompliant" Japanese Americans was created in response to growing resistance to WRA policies within the camps; a December 1942 clash between guards and inmates known as the "Manzanar Riot," in which two were killed and ten injured, was the final push. On January 11, 1943, the sixteen men who had initiated the two-day protests were transferred to Moab from the town jails where they were booked (without charges or access to hearings) after the riot. Having closed just fifteen months prior, all 18 military-style structures of the CCC camp were in good condition, and the site was converted to its new use with minimal renovation. 150 military police guarded the camp, and director Raymond Best and head of security Francis Frederick presided over administration. On February 18, thirteen transfers from Gila River, Arizona, were brought to Moab, and six days later, ten more arrived from Manzanar. An additional fifteen Tule Lake inmates were transferred on April 2. Most of these new arrivals were removed from the general camp population because of their resistance to the WRA's attempts to determine the loyalty of incarcerated Japanese Americans, met largely with confusion and anger because of a lack of explanation as to how and why internees would be assessed. The Moab Isolation Center remained open until April 27, when most of its inmates were bused to the larger and more secure Leupp Isolation Center. (Five men, serving sentences in the Grand County Jail after protesting conditions in Moab, were transported to Leupp in a five-by-six-foot box on the back of a truck. Their separate transfer was arranged by Francis Frederick, who had also handed down their prison sentences, using a law he later rescinded to charge them with unlawful assembly.) In 1994, the "Dalton Wells CCC Camp/Moab Relocation Center" was added to the National Register of Historic Places, and, although no marker exists on the site, an information plaque at the current site entrance and a photograph on display at the Dan O'Laurie Museum in Moab mention the former isolation center. Moab's economy was originally based on agriculture, but gradually shifted to mining. Uranium and vanadium were discovered in the area in the 1910s and 1920s. Potash and manganese came next, and then oil and gas were discovered. In the 1950s Moab became the so-called "Uranium Capital of the World" after geologist Charles Steen found a rich deposit of uranium ore south of the city. This discovery coincided with the advent of the era of nuclear weapons and nuclear power in the United States, and Moab's boom years began. With the winding down of the Cold War, Moab's uranium boom was over, and the city's population drastically declined. By the early 1980s a number of homes stood empty, and nearly all of the uranium mines had closed. In 1949, Western movie director John Ford was persuaded to use the area for the movie Wagon Master. Ford had been using the area in Monument Valley around Mexican Hat, Utah, south of Moab, since he filmed Stagecoach there 10 years earlier in 1939. A local Moab rancher (George White) found Ford and persuaded him to come take a look at Moab. There have been numerous movies filmed in the area since then, using Arches National Park and Canyonlands National Park as backdrops. Since the 1970s, tourism has played an increasing role in the local economy. Partly due to the John Ford movies, partly due to magazine articles, the area has become a favorite of photographers, rafters, hikers, rock climbers, and most recently mountain bikers. Moab is also an increasingly popular destination for four-wheelers as well as for BASE jumpers and those rigging highlining, who are allowed to practice their sport in the area. About 16 miles (26 km) south of Moab is the "Hole N' The Rock", a 5,000-square-foot (460 m2) 14-room home carved into a rock wall which National Geographic has ranked as one of the top 10 roadside attractions in the United States. Moab's population swells temporarily in the spring and summer months with the arrival of numerous people employed seasonally in the outdoor recreation and tourism industries. In recent years, Moab has experienced a surge of second-home owners. The relatively mild winters and enjoyable summers have attracted many people to build such homes throughout the area. In a situation mirroring that of other resort towns in the American West, controversy has arisen over these new residents and their houses, which in many cases remain unoccupied for most of the year. Many Moab citizens are concerned that the town is seeing changes similar to those experienced in Vail and Aspen in neighboring Colorado: skyrocketing property values, a rising cost of living, and corresponding effects on local low- and middle-income workers. Moab is just south of the Colorado River, at an elevation of 4,025 feet (1,227 m) on the Colorado Plateau. It is 18 miles (29 km) west of the Utah/Colorado state line. Via U.S. Route 191, it is 31 miles (50 km) south of Interstate 70 at Crescent Junction, and it is 54 miles (87 km) north of Monticello. Via Utah State Route 128 it is 46 miles (74 km) southwest of Cisco. The entrance to Arches National Park is 4 miles (6 km) north of Moab on US 191. Hurrah Pass is located on the trail between Moab and Chicken Corners. According to the United States Census Bureau, the city has a total area of 4.1 square miles (10.7 km2), all land. Moab has an arid climate characterized by hot summers and chilly winters, with precipitation evenly spread over the year (usually less than one inch per month). There are an average of 41 days with temperatures reaching 100 °F (38 °C), 109 days reaching 90 °F (32 °C), and 3.6 days per winter where the temperature remains at or below freezing. The highest temperature was 114 °F (46 °C) on July 7, 1989. The lowest temperature was −24 °F (−31 °C) on January 22, 1930. Average seasonal snowfall for 1981–2011 is 6.9 inches (18 cm). The most snow in a season was 74 in (190 cm) during 1914–15, and the snowiest month on average is December, with the record set in 1915 at 46.0 in (117 cm). As of the census of 2000,[needs update] there were 4,779 people, 1,936 households, and 1,169 families residing in the city. The population density was 1,313.1 people per square mile (506.9/km²). There were 2,148 housing units at an average density of 590.2 per square mile (227.8/km²). The racial makeup of the city was 90.35% White, 5.46% Native American, 0.36% African American, 0.29% Asian, 0.08% Pacific Islander, 1.88% from other races, and 1.57% from two or more races. Hispanic or Latino of any race were 6.44% of the population. There were 1,936 households out of which 30.5% had children under the age of 18 living with them, 44.4% were married couples living together, 12.3% had a female householder with no husband present, and 39.6% were non-families. 31.3% of all households were made up of individuals and 11.4% had someone living alone who was 65 years of age or older. The average household size was 2.43 and the average family size was 3.10. In the city, the population was spread out with 27.6% under the age of 18, 8.7% from 18 to 24, 28.5% from 25 to 44, 21.6% from 45 to 64, and 13.6% who were 65 years of age or older. The median age was 36 years. For every 100 females, there were 95.1 males. For every 100 females age 18 and over, there were 92.7 males. The median income for a household in the city was $32,620, and the median income for a family was $38,214. Males had a median income of $35,291 versus $21,339 for females. The per capita income for the city was $16,228. About 12.0% of families and 15.7% of the population were below the poverty line, including 19.1% of those under age 18 and 10.5% of those age 65 or over. Whitewater rafting and kayaking on the Colorado River. The area's most famous sections of the Colorado are Westwater Canyon which is upstream from Moab and Cataract Canyon in Canyonlands National Park which is downstream. Hiking and backpacking: Canyonlands National Park, Arches National Park, and thousands of square miles of BLM and national forest lands surround Moab. Moab is famous for canyoneering, hiking, river rafting, biking, motorcycling, ATV riding, and 4x4 driving. The Moab area is home to many easy to difficult off-road trails for novice to experienced off-roaders. Moab is home to a regional campus of Utah State University. Prior to the construction of the railroad in 1883, Moab was a strategic place to cross the Colorado River. A toll ferry service across the river ended when a permanent bridge was built in 1911. This bridge was replaced with a new bridge in 1955, which was in turn replaced by another new bridge in 2010. The 1955 bridge was subsequently demolished. The highway that uses this bridge has been renumbered multiple times and is now numbered U.S. Route 191. Moab gained freight railroad access in 1962, when a spur railroad line (now the Union Pacific Railroad's Cane Creek Subdivision) was built to serve the Cane Creek potash mine. Moab has never had passenger rail service, although the California Zephyr has advertised service to Moab in the past via stops at Thompson Springs (no longer a scheduled stop), Green River or Grand Junction, Colorado. Bus service is no longer available. There are a number of locally owned shuttle services that provide transportation to Salt Lake City and Grand Junction, CO.
Air service is available at Canyonlands Field, with daily nonstop flights to Denver International Airport via SkyWest Airlines/United Express. The region around Moab has been used as a shooting location for film and television. In the 1995 film Canadian Bacon, Moab is one of the launch locations for American missiles on the Hacker Hellstorm. The course for the pod races in Star Wars: Episode I – The Phantom Menace (1999) is a computer-generated imagery montage of Moab area landmarks, including Angel Arch. The 2010 film 127 Hours, based on the true story of Aron Ralston, was shot in the vicinity of Moab. Dave Gorman's America Unchained, shown on More4 in April 2008, which won the Audience Award for Best Documentary Feature at the Austin Film Festival. Conor Oberst's self-titled album includes a song entitled "Moab". ^ a b "Geographic Identifiers: 2010 Demographic Profile Data (G001): Moab city, Utah". U.S. Census Bureau, American Factfinder. Retrieved March 28, 2017. ^ a b Daughters of the Utah Pioneers (1972). "Moab". Grand Memories (2nd ed.). Grand County, Utah: Daughters of the Utah Pioneers. OCLC 4790603. ^ Tanner, Faun McConkie (1976). The Far Country: A Regional History of Moab and La Sal, Utah. Salt Lake City, Utah: Olympus Publishing Company. p. 89. ISBN 0-913420-63-8. ^ a b c d "Moab — History". City of Moab. Archived from the original on 2006-11-06. ^ Stubbs, Peter (1890). Autobiography of Peter Stubbs. ^ Carr, Stephen L.; Edwards, Robert W. (1989). "Denver and Rio Grande Western Railway". Utah Ghost Rails. Salt Lake City, Utah: Western Epics. pp. 188–194. ISBN 0-914740-34-2. ^ a b c d e Hansen, Arthur A. "Moab/Leupp Isolation Centers" Densho Encyclopedia (accessed 18 Jun 2014). ^ Burton, Jeffery. Confinement and Ethnicity: An Overview of World War II Japanese American Relocation Sites (National Park Service, 2011) p. 325. ^ Redsteer, Debra. "Leupp, Arizona: A Shared Historic Space for the Navajo Nation and Japanese Americans" Discover Nikkei, 28 Jun 2008 (accessed 18 Jun 2014). ^ Burton, Jeffery. Confinement and Ethnicity: An Overview of World War II Japanese American Relocation Sites (National Park Service, 2011) p. 330. ^ "Top 10 U.S. Roadside Attractions". National Geographic Society. ^ "20 best small towns in the West". Sunset. March 2009. ^ "Explore the finer side of Moab". Sunset. Retrieved May 22, 2012. ^ "Moab Pride". Moab Pride. Retrieved 16 September 2015. ^ "Moab gets First Gay Pride Festival". Salt Lake Tribune. 25 September 2011. Retrieved 16 September 2015. ^ "Moab Pride Festival Expected to Draw More than 600 Participants". The Times Independent. Retrieved 16 September 2015. ^ "MOAB, UTAH — Climate Summary". Wrcc.dri.edu. Retrieved 2012-01-30. ^ "Southeastern Utah Rejoices Over Bridge". Grand Valley Times. Utah Digital Newspaper Archive. 1912-04-12. Retrieved 2013-05-21. ^ "SkyWest United Routes November 2018" (PDF). 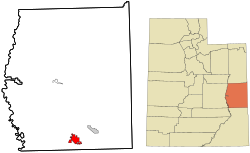 Wikimedia Commons has media related to Moab, Utah. Wikivoyage has a travel guide for Moab.